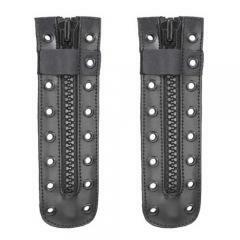 This pair of zippers feature eight eyelet design with rugged nylon teeth and VELCRO® tab to secure zipper. Made nice. But did not match my 8 eyelet boots. My fault, I should have measured and compared. Easy to put in my boots, works very well. Extremely durable and looks great. So damn much better than the laces. Product came as described and arrived very quickly. Fits on Danner boots as well and at a fourth of the price.